ABC is your single source provider for all your educational needs. Apprenticeship Program: Did you know that the largest employer in the United States is the construction industry? Millions of employees are secure in their craft professional career path and making a good living because they have hands-on experience and technical knowledge. Skilled craft professionals are in high demand in the construction industry. Check out the Apprenticeship page and start a new and rewarding career in construction today! Our apprenticeship programs meet the need of the "skilled and trained workforce" requirements. Learn more by clicking here, or by emailing us at studentintake@abcsocal.net. Electrician Certification Trainee Program: Electrical Trainees must be enrolled in a state-approved school and registered with the State as a Trainee. ABC is approved by the State to be a provider and it's classes are open to employees of ABC members and non-members. Visit the Electrician Trainee page. Continuing Education: From Journeyman Upgrades to Management Education to Safety Training. Choose from a wide variety of classes, seminars and webinars offered throughout the year at our state of the art training center. ABC SoCal is also approved by the State of California to be a provider of continuing education for electrician certification renewal. Be sure to check out the Continuing Education page to see the schedule of upcoming classes. Free Webinars for ABC Members! Many titles to choose from! ABC National has some great FREE (yes, we said FREE!) webinars coming up - take advantage of this important member benefit. Check out ABC Webinars! 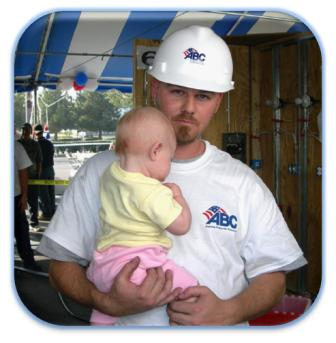 ABC SoCal is an Accredited Sponsor for the National Center for Construction Education and Research (NCCER).